Immunity is our body’s defense system against various pathogens like a virus, bacteria, toxins, etc. that make the body unhealthy and lead to disease and infections. Our immune system is responsible for our immunity. It has an important role in identifying the threat and eliminating it from the system before it causes significant damage. Antioxidants are termed as “friends” of our immune system. Vitamin A, C and phytonutrients like Xanthin and Beta Carotene are highly effective in optimizing the immune function of our body. It results in higher resistance against common diseases like cold, flu and other infections. Vitamin C is particularly known for alleviating cold and cough; and since it is a water-soluble vitamin, it’s loss from the body is at a higher rate. This loss can be replenished by fruits like passion fruits that are a rich source of Vitamin C.
If there is anything I am good at, it’s getting sick. Starting in college it was always something; minor but reoccurring…quarterly sinus infections, strep, bronchitis, colds, migraines, whatever!. When I went into my Sophomore year, I realized I couldn’t blame it on good ole Miller Dorm’s “asbestos in the walls” — shout out to my wifey, Leslie and room 6-3-5! Too many years later, I realized that what I put in my body could have a tremendous effect on my health. 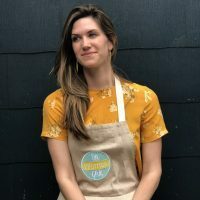 The transition started small but after more and more research, I fell into this delicious rabbit hole that has completely transformed how I view food. So, the question I ask myself as I continue to get sick with colds, fevers, migraines and other random diagnoses…is it worth it?? I now don’t get as sick as often..fewer migraines, fewer sinus infections, fewer colds. Now, on to today’s feature food…Passion Fruit. Sometimes, I will add it to my yogurt, smoothies or just eat it with a spoon, solo-style. This morning I was over it looking like Spring but feeling like Winter, so I decided to make this super tropical smoothie to pretend it wasn’t cold out. It is packed with cold-fighting ingredients that will build up your immune system but also keep your taste buds happy. Here you go! Blend and Enjoy! Reminder – If you have extras, smoothies keep up to 24 hrs.